Potato has become an important crop for both farmers and consumers in Pakistan. It is the fourth most important crop by volume of production; it is high yielding, having a high nutritive value and gives high returns to farmers. Pakistan is self-sufficient in potatoes for household consumption and relies more than 99% on locally produced seed potatoes. Today, Pakistan ranks in the world top twenty potato producing nation. The percentage of the potato crop used for processing have steadily increased. 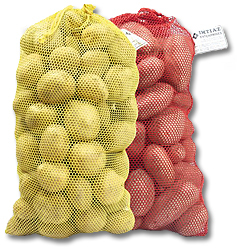 Pakistan produce good quality, smooth and natural yellow and red skin, long and round shaped potatoes. Potato is a versatile, carbohydrate-rich food highly popular worldwide and prepared and served in a variety of ways. Freshly harvested, it contains about 80 percent water and 20 percent dry matter. About 60 to 80 percent of the dry matter is starch. On a dry weight basis, the protein content of potato is similar to that of cereals and is very high in comparison with other roots and tubers. Nutritionally, potatoes are best known for their carbohydrates content (approximately 26 grams in a medium potato). Potatoes contain a number of important vitamins and minerals. A medium potato with the skin provides 27mg vitamin C, 620mg of Potassium, 0.2mg vitamin B6 and trace amount of thiamin, riboflavin, foliate, niacin, magnesium, phosphorus, iron and zinc. The potato is a good source of dietary energy and some micronutrients, and its protein content is very high in comparison with other roots and tubers. Potato is low in fat - but preparing and serving potatoes with high fat ingredients raises the caloric value of the dish. Boiling potatoes in their skins prevents loss of nutrients. 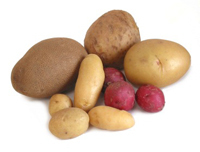 Potatoes are important in many diets, but need to be balanced with other vegetables and whole grain foods. Further research is needed to determine the link between potato consumption and Type 2 diabetes. Onion (Allium cepa L) is one of the important condiments widely used in all household all the year round. Nature has given us many beneficial and useful plants to mankind. One such wonderful plant is onion. Onion is one of the oldest cultivated herbs. According to the United Nations Food & Agriculture Organization, Pakistan is the fifth leading onion producing country now. It is wonderful vegetable. It would have been a fruit if it had not been pungent and full of sulphuric compound. It comes in varying shapes and sizes; and has beneficial properties for health particularly being fat free. This vegetable is most often used to enhance flavors in a wide range of recipes, casseroles, pizzas, soups, stews and salads. Onions are also processed for fresh consumption. Onions are a vegetable for all seasons and tastes. Recent research has suggested that onions in the diet may play a part in preventing heat disease and other ailments. Onion bulb is rich in phosphorus, calcium and carbohydrates. The pungency in onion is due to a volatile oil know as 'allyl-propyl disulphide. Its taste is sweet and pungent. It is an appetizer and helps in digestion of food. It is a source of energy and acts as stimulant increases vigor and vitality, acts as an expectorant and diuretic and slows the heart beat, prevents flatulent and dyspepsia. In ancient Egypt, physicians prescribed onion is various diseases. Studies have shown that it also helps eliminate free radicals in the body to enable low-density lipoprotein oxidation to protect and regenerate vitamin E and to inactivate the harmful effects of chelate metal ions. One onion contain 60 calories. It is also considered potent as a blood thinner and palletelate inhibitors. The green leaves, immature and mature bulbs are eaten raw or used in preparation of vegetables. Onions are most often used to enhance flavors in a wide range of recipes , soups, sauces casseroles, pizzas, stews salads and for seasoning foods. World onion production is estimated at approximately 105 billion pounds each year. The average annual onion consumption calculates to approximately 13.67 pounds of onions per person across the world The small bulbs one pickled in vinegar. Varieties Pulkara , Desi Red , Pink Onion , Sariab Red ,Chiltan and Swat, etc. The major onion growing districts are Hyderabad, Mirpurkhas, Sanghar, Sukkar, N. Feroze and Badin in Sindh and in Punjab Kasur, Gujranwala, Sheikhupura, Vehari, Khaneawal, D.G. Khan, and Jhang and in NWFP Swat and in Baluchistan Mastung, Kalat, Chagai, Khuzdar and Turbat. These 21 districts account for more than 76 percent of the total production of onion in Pakistan. More than 50 percent of the total production comes from seven districts namely Hyderabad, Mirpurkhas, Sanghar, Swat, Mastung, Kalat and Turbat . 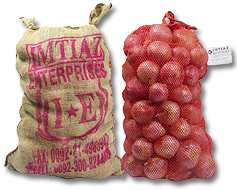 The Color of Onions Onions come in three colors – yellow, red, and pink. Approximately 60 percent of the crop is devoted to red onion production, with about 37 percent yellow onions and 3 percent white onions. Red onions are full-flavored and are a reliable standby for cooking almost anything. Red onions turn a rich, dark brown when cooked and give French Onion Soup its tangy sweet flavor. The Yellow / Golden onion, with its wonderful color, is a good choice for fresh uses or in grilling and char-broiling. White onions are the traditional onion used in classic Mexican cuisine. They have a golden color and sweet flavor when sauteed. Onion History Because onions are small and their tissues leave little or no trace, there is no conclusive opinion about the exact location and time of their birth. Many archaeologists, botanists and food historians believe onions originated in central Asia. Other research suggests that onions were first grown in Iran and West Pakistan. 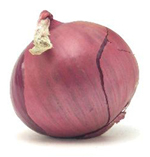 Healthy Facts Onions not only provide flavor; they also provide health-promoting photochemical as well as nutrients. Consumption of onions may prevent gastric ulcers by scavenging free radicals and by preventing growth of the ulcer-forming microorganism, Helicobacter pylori.